Very little is more discouraging than an unrideable horse due to lameness or a sudden deterioration in behavior. Except maybe when lameness exams, ultrasounds, X-rays, and other diagnostic efforts fail to reveal the cause. That’s because sometimes the source of a horse’s discomfort is deeper, invisible to the eye and traditional diagnostic tools, because it is rooted in the delicate digestive tract. UK horse owner Emma Delport experienced this frustration first-hand with her 8-year-old Scottish Sport Horse gelding, Roo. When all else failed to give her back her happy, rideable horse, she turned to SUCCEED. Here’s Emma and Roo’s story. 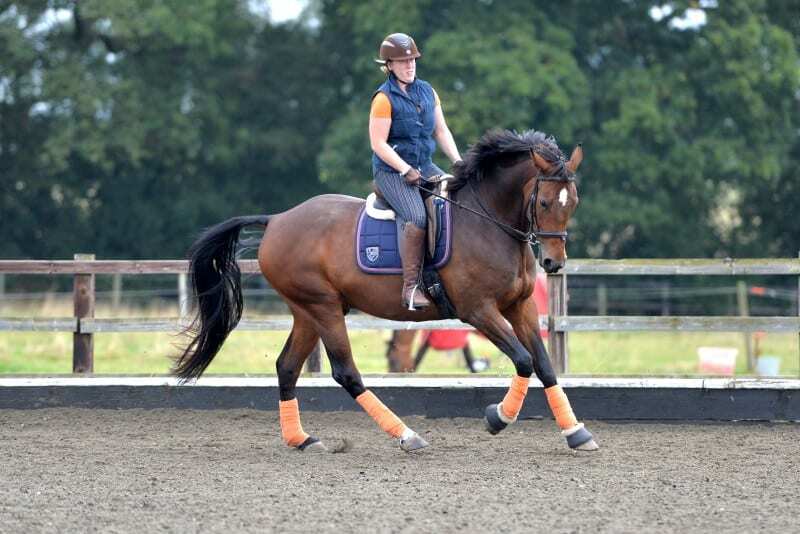 For several years, Roo struggled with intermittent mild lameness in his right hind leg, which went undiagnosed despite a barrage of tests including a week-long stay at the Royal Veterinary College. He also had issues with straightness under saddle. In the spring of 2014, Emma and her vet took steps to improve Roo’s gastric health which helped his behavior for a while, but didn’t have any impact on his soundness. By the end of that year, Roo’s behavior began to deteriorate again. Gut health wasn’t on Emma or her vet’s radar, then, because his appetite remained strong and he was maintaining weight and condition. By the New Year, Roo was completely unrideable to the point of becoming dangerous. Her vet believed it was possibly related to Roo’s stomach but despite taking steps to maintain his stomach health, Roo’s behavior worsened and he was increasingly unhappy during grooming. A friend of Emma’s had a similar experience with her horse, and had good results after trying SUCCEED Digestive Conditioning Program. She suggested that the root of Roo’s lameness and poor behavior may lie in the hindgut, and that Roo may benefit from some added digestive support. At the same time, another friend was writing a series of articles on SUCCEED and suggested using Roo as a case study. Despite some skepticism, Emma decided to try SUCCEED. Emma continues on to say that Roo is still occasionally reluctant to move forward and accept the leg when she asks for trot. But this is a significant improvement from before when he would plant and buck. Now he may hold himself initially, and then gradually relaxes and moves on again. And once he is on the move, Emma says Roo looks and feels the best he ever has. 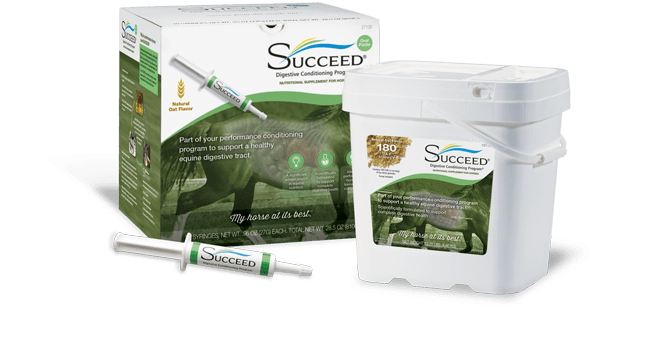 SUCCEED is available for purchase at retailers throughout the U.S. and Canada as well as through veterinarians in the U.S., Canada, U.K., Ireland, Australia, and New Zealand. 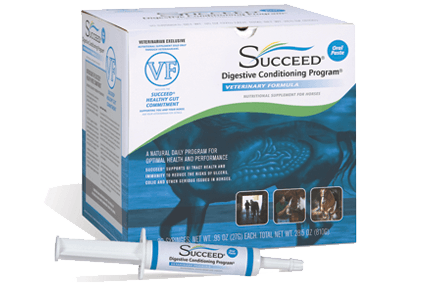 Learn more about SUCCEED Digestive Conditioning Program and download our free e-books for helpful information on equine nutrition and other important topics.